Spanning five turbulent decades in Iranian history, from before the 1979 revolution, through the Islamic Republic, and up to the present, The Book of Fate is a powerful story of friendship and passion, fear and hope. 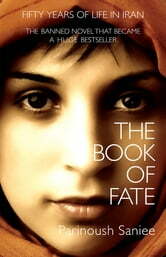 A teenager in pre-revolutionary Tehran, Massoumeh is an average girl, passionate about learning. On her way to school she meets a local man and falls in love, but when her family discovers his letters they accuse her of bringing them dishonour. She is badly beaten by her brother, and her parents hastily arrange for her to marry a man she’s never met. Facing a life without love, and the prospect of no education, Massoumeh is distraught, but a female neighbour urges her to comply: "We each have a destiny, and you can’t fight yours." The years that follow Massoumeh’s wedding prove transformative for Iran. Hamid, Massoumeh’s husband, is a political dissident and a threat to the Shah’s regime. When the secret service arrive to arrest him, it is the start of a terrifying period for Massoumeh. Her fate, so long dictated by family loyalty and tradition, is now tied to the changing fortunes of her country. I absolutely loved this book. Was hooked from the very beginning. I could not put it down. It really made me think about my reality and what someone else calls reality and how different it could be. What a captivating novel! A disappointing ending (that I'd hoped would have turned out differently) but nonetheless was realistic and therefore understandable. I was hooked from the beginning to the end and couldn't put the book down! A must read for sure! I will certainly be reading it again. Bravo! Captivating This novel describes the personal life of a teenager in Tehran, dreaming of becoming educated. She fell in love with a doctor who moved back to his home town. Against her will, she married a buinesman involved in political activities during the evolution and the war between Iran and Iraq. She experienced challenging situations on her and the family. A very interesting novel worth reading. I highly recommend this book. I know little about Iranian culture and confess I've never read much about it. However this book transcends culture delving into the spirit of a young woman, examining her life but more so her soul. I was so emerged in this book that I read until my vision blurred. This is a powerful story. Nothing I can say does justice. Definitely an excellent read.